Ivy Brambles Bamboo Silk Sock yarn arrives in beautiful hand-dye colors inspired by nature! 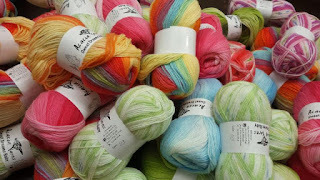 Soft and luscious, this 20% bamboo,15% mulberry silk, 65% superwash merino wool yarn comes in 100 g 380 yard skeins... a must have for wonderful handmade socks that are a pleasure to knit... even in the summer! Also perfect for the shawl/shawlette or lace scarf that require a gorgeous yarn with superior drape! Try some today in one of the beautiful colors! Your feet will thank you! And remember, FREESH12 in the coupon code box at checkout gets you free standard shipping on all instock orders over $25 now through the end of June!